Established in 1910, the internationally recognised Bulletin of Entomological Research aims to further global knowledge of entomology through the generalisation of research findings rather than providing more entomological exceptions. The Bulletin publishes high quality and original research papers, 'critiques' and review articles concerning insects or other arthropods of economic importance in agriculture, forestry, stored products, biological control, medicine, animal health and natural resource management. The scope of papers addresses the biology, ecology, behaviour, physiology and systematics of individuals and populations, with a particular emphasis upon the major current and emerging pests of agriculture, horticulture and forestry, and vectors of human and animal diseases. This includes the interactions between species (plants, hosts for parasites, natural enemies and whole communities), novel methodological developments, including molecular biology, in an applied context. 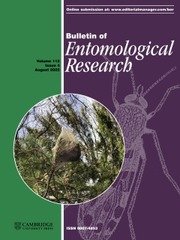 The Bulletin does not publish the results of pesticide testing or traditional taxonomic revisions.